The labour unions in Nigeria say they would commence a nationwide, indefinite strike from November 6 if government does not meet their demands. The President of the Nigeria Labour Congress (NLC), Ayuba Wabba, and that of the United Labour Congress, Joe Ajaero, stated this in a press statement on Sunday. The labour unions are angry at government's stance on new minimum wage for workers. 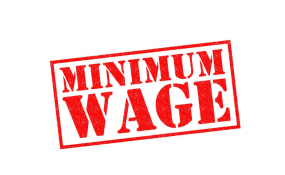 The federal government insists it will could only increase the minimum wage from the current N18,000 to N24,000, claiming no amount was agreed with the labour leaders at a meeting of a tripartite committee also involving the private sector. The labour unions, who initially demanded N50,000 mimimum wage, however, say they agreed to N30,000 during the negotiation. It is not true that we proposed N30,000 as the new national minimum wage, the labour leaders said. "It is also not true that the committee did not agree on a figure during its last sitting. We accepted N30,000 as a compromise to demonstrate the willingness of Nigerian workers to make sacrifices towards nation building," the officials said. Messrs Wabba and Ajaero said it has become necessary for the Organised Private Sector (OPS) as represented in the tripartite committee to speak up on this matter. "Keeping silent in the face of this apparent mischief does our nation no good. At this time the OPS does not have any other choice but to rise to the occasion by telling Nigerians what transpired in the meeting. "What we are waiting for is for the federal government to immediately set in motion the necessary machinery for turning the agreement into a Bill for onward submission to the NASS where we expect the presidency to work together with the legislators to make it a law so that it can be implemented quickly." They said labour unions in Nigeria have not seen any sign of seriousness on the government's part to resolve workers' concerns. "A day of national outrage and mourning which will be used to sensitise Nigerians on our plight and on the issues at stake. This shall take place in all states of the federation including Abuja on Tuesday, the 30th day of October, 2018," they said. They said the Joint Central Working Committee (CWC) meeting of all the labour centres in Nigeria will hold to receive reports and make final preparations for our ultimate engagement with the federal government on the matter on November 2. PREMIUM TIMES reported how the unions had embarked on a nationwide strike on September 26 to compel the tripartite committee to complete its assignment on the new minimum wage.